Villa Kasteli i Santorini, Grekland : Boka nu! 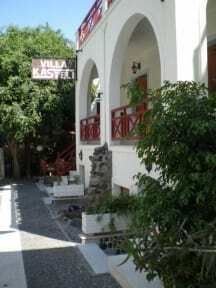 Villa Kasteli offers hotel rooms and hostel rooms. It is located at Perissa. The famous black sandy Perissa beach is within walking distance. There is also a wide variety of cafes, bars, restaurants and taverns by the sea. There is a bus stop almost outside the hotel. Villa Kasteli is located at a village called Perissa on the south-east coast of Santorini. The famous Black Sandy Perissa Beach of Santorini stretches within walking distance from our hotel. It is about 13 kilometers from Fira. There is a bus stop almost outside the hotel which provides regularly scheduled buses to and from the other towns of the island. A 24-hour bakery with delicious food is opposite the hotel. Close to our hotel there are travel agencies where daily trips and activities (scuba diving, snorkeling etc.) can be arranged. There are also many places where you can rent a car or a motorbike. There is a bus stop almost outside the hotel with regularly scheduled buses to and from the other parts of the island. We offer spacious rooms, with private bathrooms, air condition and fridge. The rooms are cleaned every day. 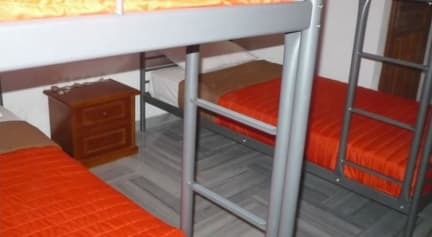 Towels and sheets are also provided free of charge. Although the rooms are on the semi basement, there are windows that let plenty of sunlight and fresh air come into the rooms. Our hotel is in a dead end street so it is very quiet as there are no cars passing by. Complimentary Wi-Fi access is available in the rooms and public areas. Free public parking area right next to our hotel. Payment upon arrival by cash, credit cards, debit cards. Tshi property may pre-authorise your credit card. Reception hours 8.00 until 21.00.